This is a detail from the illuminated manuscript of The Benediction of St Aethelwold, written by Godeman for St Aethelwold, Bishop of Winchester. The scene depicts St Elizabeth on a couch with the infant John the Baptist behind her in a crib. Beneath them, Zacharias writes John's name on a wax tablet with a stylus. 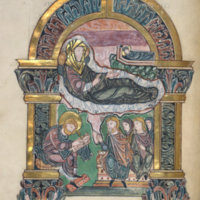 "The Nativity of St John the Baptist on Benedictional Page." Add MS 49598 f.67v. British Library Images Online. Accessed February 16, 2015. http://imagesonline.bl.uk/imagemap/?search=The+British+Library+Collection&level=1&cat_id=146&last_cat_id=&page=672. 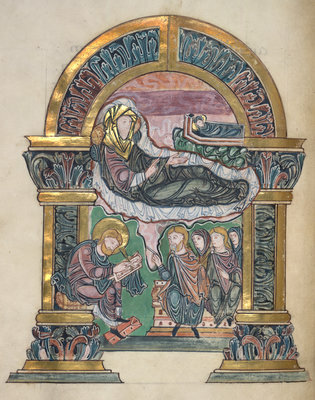 “The Nativity of St. John the Baptist (from British Library MS Add. 49598, f.92v),” Medieval London, accessed April 22, 2019, http://medievallondon.ace.fordham.edu/items/show/104.